175,000 square feet of creative office space, 147,000 square feet of which will be home to cybersecurity and IT operations analytics solution provider Rapid7's new headquarters. 210,000 square feet of multi-level retail/restaurant space. Star Market will occupy 60,000 square feet, an ArcLight Cinema with 15 screens will occupy 60,000 square feet and an entertainment venue by Big Night Entertainment Group and Live Nation New England will occupy 31,680 square feet. 64,000 square feet of TD Garden expansion space. 10,000 square feet of outdoor space, including a new entrance to TD Garden and North Station. 540 new underground parking spaces connected to the existing garage. Completion of Phase One of The Hub on Causeway wrapped up in late 2018. Phase Two will consist of a 38-story residential tower, Hub50House with approximately 440 units and a 10-story citizenM hotel tower with approximately 260 rooms. Phase Three will consist of a 21-story office tower totaling approximately 525,000 square feet. Exterior glass install is progressing for the residential tower of the Hub on Causeway, dubbed Hub50House. The teaser website for the 440 unit building promises "Boston's move innovative residential experience". Units will range in size from 1 through 3 bedrooms and resident amenities will include a rooftop pool. Elsewhere on the massive project, tenant fit-out is underway within the podium for the Rapid7 Headquarters that will occupy nearly 150,000 square feet of this 175,000 section of the project. On top of the podium, a second tower crane is in place for construction of the third and final phase, another 525,000 square feet of office space. Verizon Communications has already leased 440,000 square feet here. All phases of the project are expected to be complete by 2021. This past Saturday afternoon fire broke out on the 25th floor of what will be the residential tower for The Hub on Causeway. The three-alarm fire is estimated to have caused around $200,000 worth of damage to the project. Despite this hiccup, construction is ongoing across all three phases of the project. Interior fit-outs are underway for the office and retail space as part of the podium in Phase 1. Phase 2, where the fire occurred continues with glass facade install while steel framing is going up for Phase 3, atop the podium. The 38-story residential tower at The Hub on Causeway will contain around 440 rentals and a 10-story citizenM hotel tower with approximately 260 rooms. Resident amenities will include a rooftop deck and a sky deck for dogs, "the Woof Deck". Construction here is expected to be complete later this year into early 2020. The final phase of the project, the office tower, where Verizon has already signed up to lease 440,000 square feet is set to be complete in 2021. A building permit has been issued for the fit out of The Star Market at The Hub on Causeway. The supermarket will be the city's largest at 60,000 square feet with fit-out costs estimated at around $20 million. The new grocery store will be completed by Danvers-based company, CM&B. Portions of Phase 1 of the project, the parking garage, and the new TD Garden/North Station Entrance are now open. The supermarket is set to open later this year. Other commercial tenants moving into the space include a 15 screen ArcLight movie theatre. With the new entrance to the TD Garden now open and exterior work continuing on the residential tower, another crane is in place and construction has started for the third phase of The Hub on Causeway. This final piece of the puzzle will feature over 650,000 square feet of office space above the podium built during phase 1. Verizon has already committed to a 440,000 square foot lease within the building. The office tower will feature large floor plates, high ceilings, and an abundance of natural light. The office tower’s most dramatic elements are two-story bump-outs that extend from the corners on several levels, providing bright, open work areas with wide, two-story stairwells connecting floors. Construction on this final phase is set to be complete in 2021. The glass facade install for the 38 story tower that is part of Phase II of the Hub on Causeway has started. The residential tower will include around 440 units. As part of Phase II a 10 story CitizenM hotel will also be constructed to contain 269 guest rooms. While this work is ongoing Phase I of the project is nearing completion with the parking garage now open. A certificate of occupancy has been issued for the new parking garage at The Hub on Causeway along with other sections of Champions Row. The new parking garage brings 540 new parking spaces to the existing garage. This first phase of the project also includes the new entrance to TD Garden along with North Station and 64,000 sf of expansion space for the arena. Expected to open soon are additional sections of Phase One including the Start Market and ArcLight Cinemas. With construction rapidly progressing, Chris Maher, VP Development at Deleware North, told the audience at ULI's fall meeting that Phase One of The Hub on Causeway will open on November 1st. The new entrance to the TD Garden and North Station is the centerpiece of this design and offers a striking impression from Causeway Street. This first phase will also include a 60,000sf Star Market, 15 screen ArcLight Cinema along with 540 parking spaces and 64,000sf of the TD Garden expansion space. Phase Two of the project will consist of a 38-story residential tower with approximately 440 units and a 10-story citizenM hotel tower with approximately 260 rooms. Phase Three will consist of a 21-story office tower totaling approximately 525,000 square feet. Exterior work on the first phase of the Hub on Causeway is rapidly progressing with expected opening later this year. Phase one of the project includes 175,000 square feet of creative office space and 210,000 square feet of retail/restaurant space. Last month Boston Properties & Delaware North announced 75% of space is already leased. 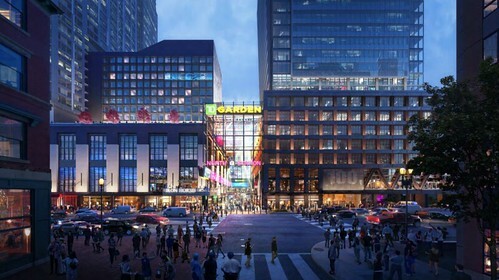 Phase One also includes a new grand entrance to the TD Garden and entry for North Station. Phase Two of the project, the 38-story residential tower set to include around 440 units and a 10-story citizenM hotel is expected to be complete in late 2019. Delaware North and Boston Properties have announced that with the signing of a lease with Verizon for 440,000 square feet of space, The Hub on Causeway project is more than 75 percent leased. The 1.87 million square foot mixed-use development will feature three towers with retail, office, hotel, and residential uses. Completion of Phase One of The Hub on Causeway is expected in late 2018. Phase Two will consist of a 38-story residential tower with approximately 440 units and a 10-story citizenM hotel tower with approximately 260 rooms. Phase Three will consist of a 21-story office tower totaling approximately 525,000 square feet. Boston Properties has acquired the Office Tower Parcel, Office Light and Air Easement Area at The Hub on Causeway for $37.59 million. The area, totaling 75,445 square-feet is part of the $950 million mixed-use development featuring three towers with retail, office, hotel and residential uses. With every passing day, The Hub on Causeway continues to rise uo into the Boston skyline. The 1.87 million square-foot mixed use development is transforming the rapidly changing Bulfinch Triangle surrounding the TD Garden. Glass installation is underway as the building's exterior begins to take shape. Phase I of the three phase project is expected to be complete in late 2018 and will consist of 459,000 square-feet of office, retail, restaurant, and outdoor space. Phase III of Hub on Causeway, is moving forward with a Notice of Project Change (NPC) that will update the office design, responding to a new generation of office and workforce needs. The updates include the flexibility to accommodate future changes of the building’s tenants. 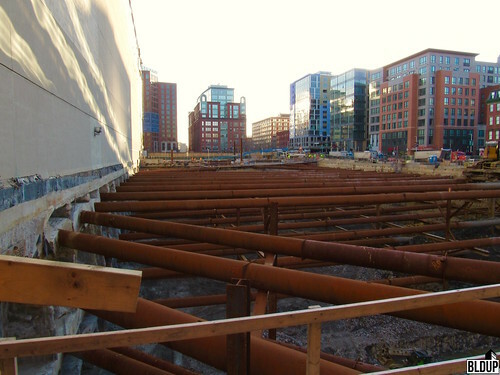 The project, located on 80 Causeway, was originally approved in 2013 and is currently under construction at the former site of the Boston Garden, adjacent to TD North and North Station. The approved changes include: higher floor to floor heights, floors with increased ceiling heights, enclosed two story balconies in certain portions of the office tower, outdoor terraces on specific levels of the office tower, a higher occupiable floor above the project’s podium and larger maximum floor plates and office height tower from grade. Dutch boutique hotel chain citizenM has officially leased space for the upcoming 10-story, 260-room hotel at The Hub on Causeway for $45 million. citizenM operates nine hotels worldwide in Europe and New York City featuring trendy, stylish rooms and common spaces. Key amenities at citizenM hotels include free Wi-Fi throughout, designer furniture and ultra-comfortable beds. Phase I of the Hub on Causeway continues as construction stays on pace for completion in 2018. The first phase of construction consists of 210,000 total square feet of multi-level retail/restaurant space, including the city of Boston’s largest supermarket, a 60,000 square foot Star Market, and the Northeast’s first ArcLight Cinema, ArcLight Boston, a 60,000 square foot theater with 15 screens. The Hub on Causeway is growing not only in stature! The Hub on Causeway is progressing nicely and getting taller. Boston Properties recently submitted to the city that they would like to change the height of one of the towers from 420 feet to 495 feet to meet the changing needs of the marketplace. This transformative mixed use project will be adding to the already changing neighborhood. Rising from a lively podium, office, residential and hotel towers will house premium entertainment venues, specialty retailers, high-concept dining and loft-style office space to result in a work/live/play “city within a city.” A steel-and-glass structure reminiscent of the district’s original railways forms the façade of the eight-story gateway, which connects directly to the North Station transportation hub. It is also rumored that Verizon's new brand Oath will be an anchor tenant as reported by major news outlets recently. 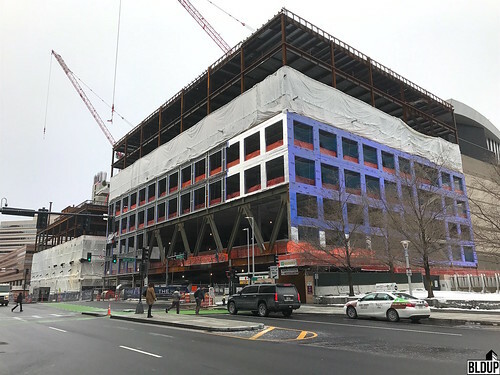 The $950 million, 1.87-million-square-foot Hub on Causeway mixed-use development, which is transforming the long-vacant former site of the storied Boston Garden arena into a 21st century mixed-use development, celebrated a major milestone yesterday with the topping off of its’ Phase One podium. A 39-foot steel beam, the final piece of the podium, was signed by project team and community members and placed at the top of the future entrance to The Hub on Causeway. Standing 100 feet in the air, the beam will be located at the top of the podium’s future 15-screen ArcLight Cinemas movie theater, set to open in late 2019 along with a 60,000-square-foot Star Market, which will become Boston’s largest grocery store, a 31,680-square-foot entertainment venue by Big Night Entertainment Group and Live Nation New England and cybersecurity and IT operations analytics solution provider Rapid7’s new 147,000-square-foot headquarters. Phase One of The Hub on Causeway will feature a total of 175,000 square feet of office space and 210,000 square feet of multi-level retail/restaurant space, along with a new glass-topped atrium entry for TD Garden and a new entrance and underground connector tunnel for North Station that are due to open in October 2018. Over 11,000 tons of steel have been erected in order to construct the Phase One podium. “Thanks to the hard work of so many people, The Hub on Causeway will soon be the new gateway to Boston, forever changing the landscape of this neighborhood for the better,” said Charlie Jacobs, CEO of Delaware North’s Boston Holdings, in a prepared statement. The Hub on Causeway is now visible from Interstate 93 approaching Boston from the north. Leading cybersecurity and IT operations analytics solution provider Rapid7 has announced it will relocate its global headquarters from 100 Summer Street in the Financial District to the first phase of the 1.87-million-square-foot Hub on Causeway mixed-use development in Bulfinch Triangle. Rapid7 will occupy 147,000 square feet at The Hub on Causeway, also relocating its’ Cambridge team at 1 Main Street. Rapid7 expects to move to The Hub on Causeway in the second half of 2019, following the first phase’s completion in late 2018. Rapid7 will be the first phase’s anchor tenant; a total of 175,000 square feet of creative office space will be built as part of the first phase, in addition to 210,000 square feet of multi-level retail/restaurant space and 64,000 square feet of TD Garden expansion space. Future phases of The Hub on Causeway call for a 38-story residential tower with approximately 440 units, a 10-story citizenM hotel tower with approximately 260 rooms and a 21-story office tower totaling approximately 525,000 square feet. Rapid7 is the latest addition to the Bulfinch Triangle neighborhood’s growing technology presence. “We believe that The Hub will allow us to capitalize on the momentum we’ve built as a leading global technology company and expect to see increased productivity through the joining of our Boston-area offices,” said Corey Thomas, president and CEO of Rapid7, in a prepared statement. “We believe The Hub will offer us the room we need to grow and help spur a new innovation center in Boston amid the escalating costs of the Seaport and Cambridge. For us, the decision to move our headquarters is about creating a phenomenal work experience for our Boston-area employees while continuing to invest in the Boston community and the exceptional talent pool it develops.” Rapid7 employs over 1,000 people globally, with nearly 500 Boston-area employees. Renowned entertainment venue proponents Big Night Entertainment Group and Live Nation New England have secured a lease of 31,680 square feet at the upcoming Hub on Causeway mixed-use development in Bulfinch Triangle, in which the proponents will open a new entertainment venue. Big Night and Live Nation’s new venue will be part of The Hub on Causeway’s first phase, which is on schedule for completion in late 2018, and will be located primarily on the development’s second floor, with a 1,324-square-foot lobby on the ground floor. In a January 2016 interview with the Boston Herald, at which time the lease was still being negotiated, Live Nation President Don Law said the venue will be “a nightclub, restaurant, concert venue and bowling facility combination”. Law also revealed that “[Big Night founder] Ed [Kane] is going to run [the venue], and … [Live Nation will do] the music”. Per Law’s interview, the venue’s name “will include ‘rock’ and ‘bowl’”. The Hub on Causeway’s first phase will feature 175,000 square feet of creative office space, 210,000 square feet of retail including Star Market and ArcLight Cinema, and 64,000 square feet of TD Garden expansion space. WeWork has leased 38,000 square feet in The Hub of Causeway’s first phase for a new collaborative workspace. Subsequent phases of The Hub on Causeway will construct three new towers featuring residential, hotel and office space. The $950 million development will span a total of 1.87 million square feet. Collaborative workspace provider WeWork and live entertainment company Live Nation Entertainment Group have reportedly leased space at the 1.87 million square foot Hub on Causeway mixed-use development in Bulfinch Triangle. Developer Boston Properties has announced that Live Nation has leased 32,000 square feet for a new live music venue. Per a tweet by Steve Adams of Banker & Tradesman, WeWork has leased 38,000 square feet for a new collaborative workspace; WeWork spaces include shared co-working space as well as private offices. Both tenants would open within the first phase of The Hub on Causeway, which will open in late 2018. We had the honor and privilege of joining Boston Properties and Delaware North at the official groundbreaking ceremony today for Phase One of The Hub on Causeway! We are very excited to watch John Moriarty and Associates build this project and cannot wait to experience the energy The Hub on Causeway will bring to the Bulfinch Triangle neighborhood and downtown Boston. Anticipated completion of Phase One is in late 2018. Learn more about Phase One and see project renderings below. Also take a look at our photographs from today's groundbreaking ceremony, posted above! 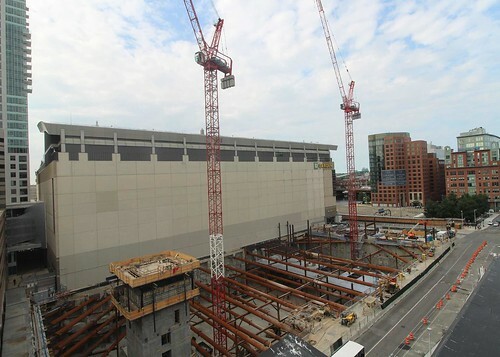 The TD Garden project is off to a strong start! John Moriarty and Associates is hard at work preparing the former parking lot on Causeway Street for the ultimate construction of a three-tower mixed-use development. View our site photographs above, and stay tuned for further updates! For official project renderings, visit http://www.bostonredevelopmentauthority.org/getattachment/43af8d83-a3c0-4d67-a242-43c42f7affe4. As per the Hub on Causeway Project, you may want to edit the BUILDING HEIGHT listed: neither of the two towers will be near 600 FT in height because of all those opposed to tall buildings in that altitude range (despite the fact that Boston already has a few towers in excess of 600', but of course not adjacent to the West and North Ends). Though without any data to support my estimate, at 38 stories and approx. 12 FT per floor, the Residential Tower should stand in at around 456 Feet. As well, the renderings of the two towers together make them appear somewhat comparable in height, but maybe that is just a perspective glitch within the illustration; the office tower at 21 stories should be somewhere around 252 FT with the same estimated height per floor parameter.